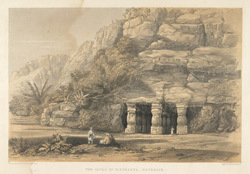 Lithograph of the exterior of the Cave of Elephanta by Day & Son from Sir Harry Darrell's 'China, India and the Cape' published in London in 1852. The Shiva temple on the small island of Elephanta, off the coast of Bombay, is celebrated as one of the greatest achievements in rock-cut architecture in India. The temple dates from the sixth century, stands at 250 feet above sea level and measures 130 feet square. The interior of the cave is supported by a hypostyle hall and adorned with sculptural figures depicting the different aspects of Shiva. While the east entrance to the cave leads towards the linga shrine, the north entrance faces the great Trimurti, the triple-headed bust of Shiva. The temple is also flanked by two courts to the east and west of the main shrine.